Getting a flat stomach is one of the hardest body goals there is, especially when you’re not going about it in the right way. Sticking with the same methods of trying to flatten your tummy won’t get you anywhere. You need to be willing to switch it up and do specific things to get the stomach you want. The main reason that Pilates is such a great form of exercise when you’re trying to flatten your belly is because you learn to pull in the muscle that protects your back and flattens your stomach, the transverse abdominus. Even if you only go to one class per week, your belly will start evening out before you know it. Maintaining good posture throughout the day is the easiest way to work on your flat stomach at all times. Standing up straight helps keep your abs tight and the muscles working. When you catch yourself slouching, make a note to straighten up. 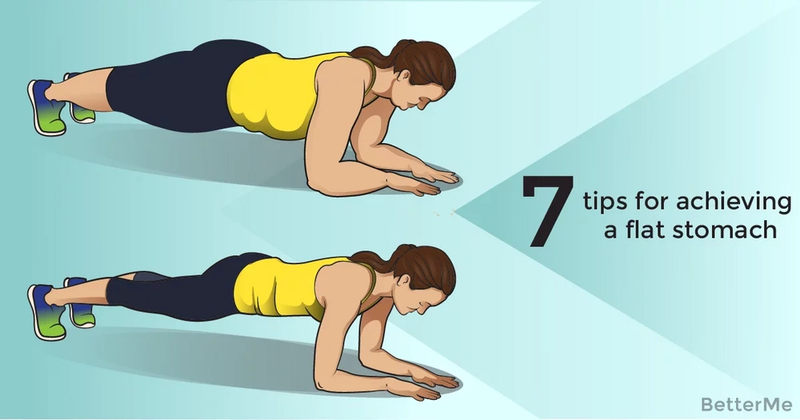 The plank position has become so popular for good reason. It is a simple and convenient way to strengthen your core, leading to a flatter tummy. Take breaks throughout your day, wherever you are, and jump into plank for 30 seconds. We all have that one pair of pants that takes a lot of effort to zip up. Think about the way you maneuver your stomach to zip those jeans, and copy that movement a few times throughout your day. You’ll be sucking in your stomach and working towards flatness. There’s no path to a flat stomach that doesn’t involve a clean diet. You have to accept this fact, if you want to get your tight tummy, and let go of added sugars and junk food. Performing a full-body roll up at least three times throughout your week with help you tighten your core muscles and lead them to stay flatter and flatter as time passes. Incorporate these simple 7 tips into your standard lifestyle and you will be on your way to sculpting the flat stomach you want. Don’t forget to drink enough water!